In March of 1920, Joseph W. Breen, a member of the newly formed American Legion and an officer of Breen-McCracken Legion Post 297, met in Philadelphia with fifteen other prominent Legionnaires where they originated the idea of The Forty & Eight. They envisioned a new and different level of elite membership and camaraderie for leaders of the American Legion. The boxcar of the French railways, so familiar to American ground troops of the First World War, was chosen as the symbolic heart of the new organization. The French/Railroad theme was applied to officer titles and organizational functions. The organization was named La Societe des Quarente Hommes et Huit Chevaux (The society of forty men and eight horses). Its members were called Voyageurs Militaire (military travelers) and candidates for membership were called Prisonniers de Guerre (prisoners of war). 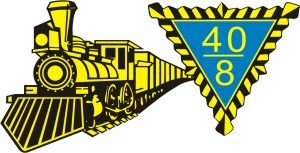 The “40&8” cargo capacity sign emblazoned on each French boxcar that had carried American doughboys to the front, and also the “French horizon blue” color, became symbols of the new society. An initiation ceremony was developed based on the common wartime experiences of American soldiers, sailors, and marines, incorporating fun making with patriotic bonding.